Today, kristinjoydiede.com, in association with the family members of Robert Michael Anderson, announced the establishment of a reward in the amount of five thousand dollars for anyone who successfully discovers human remains belonging to either Kristin Joy Diede or Robert Anderson. The North Dakota Bureau of Criminal Investigation (BCI) must positively identify any found human remains as belonging to either Kristin Joy Diede or Robert Michael Anderson through DNA analysis. ‘BCI’ must also confirm such a positive match with official statement and documentation to the general public. Robert Anderson’s son, Chase Anderson of Amery, Wisconsin says, ‘We feel strongly that my father and Kristin Diede met their demise near Wishek on August 15th, 1993 and that the person or persons responsible for their deaths drove the van to Aberdeen to make it appear that they had taken off. We are urging hunters, surveyors, farmers and others who enjoy the outdoors anywhere in the areas from Wishek to Aberdeen to please keep an eye out for human remains, buried clothing, shallow graves or any other suspicious looking objects. If you see anything suspicious, do not disturb the discovery sight and please call your local Sheriff’s office. Possible routes from Wishek to Aberdeen. There are many ways to travel from Wishek and Aberdeen and we urge all persons spending time outdoors in these areas to keep their eyes open for anything out of the ordinary. 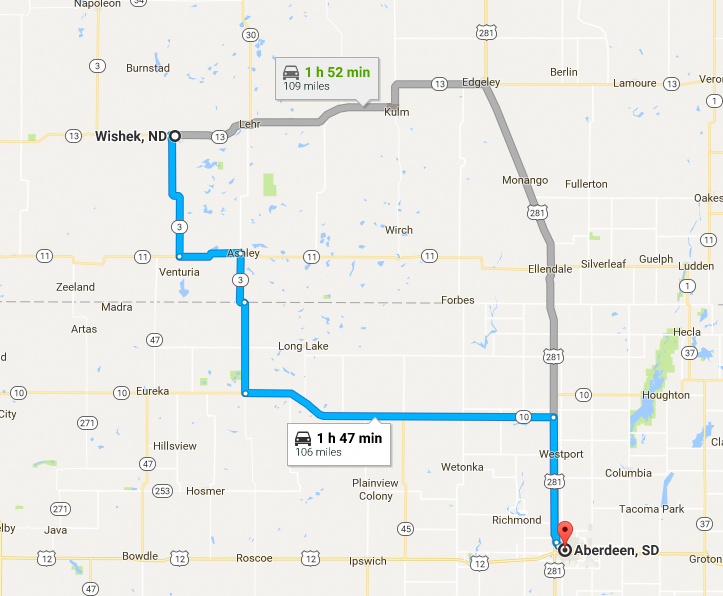 Map – Wishek -> Ashley -> Ellendale -> Aberdeen. Map – Wishek -> Ashley -> Leola -> Aberdeen. The above routes are of course only a small sample of the many possible paths to drive from Wishek to Aberdeen. The area is full of small roads including many gravel roads. If you would like to contribute to this reward or donate to help offset costs for this cause, please email us for information. unsufferus@gmail.com. Major contributors may choose to be acknowledged and recognised on this website or to remain anonymous.